Arsenal right-back Hector Bellerin appeared to subtly troll Watford star Troy Deeney after today’s game at the Emirates Stadium. 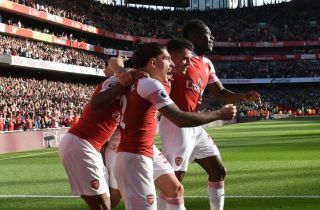 The Gunners won a closely-fought encounter 2-0 in today’s Premier League game, with the club’s two goals both coming in the final ten minutes of the match. It wasn’t an easy afternoon for Arsenal by any stretch of the imagination, but they held their nerve and did what was needed late on to take the three points in a way that must have been pretty satisfying for new manager Unai Emery. The Spanish tactician had the tough job of replacing the long-serving Arsene Wenger this summer, but appears to have instilled a winning mentality in this squad, or should that be ‘cojones’? Some of you may remember Deeney saying Arsenal lacked precisely that after their game at Vicarage Road last season. Okay, it’s two cherries, but what else could he be referencing, especially when they look like that?